Maybe you don’t know a ton about the Nashville Predators. That’s OK! It’s understandable. They don’t have a ton of history, and they certainly don’t get picked for a lot of national broadcasts. They underachieved in the regular season. Their top line—maybe the best of the eight teams remaining in the playoffs—comprises three guys that even casual hockey fans may only know in passing. But here’s one thing I’ll wager: You do know P.K. Subban. Last summer’s blockbuster trade that sent Shea Weber to Montreal worked out well for both teams, though because Subban is four years younger, I figure it will work out better longer for Nashville. But the 27-year-old Subban doesn’t merely give the Predators a scoring blueliner and an anchor for a second defensive pairing (with Matthias Ekholm) as good as any in the league—it gives them a bonafide crossover superstar. By every account, Subban lives up to his reputation as one of the most likable, genuine, and generous men in the NHL, and you really couldn’t do much better to draw the attention of casual fans. Having Subban on your team is just good marketing, and I feel entirely comfortable helping to do his PR. Hockey players are, on the whole, a boring bunch. They speak in clichés and only occasionally let their personalities seep through. If I was trying to get someone into hockey—a child, say—there aren’t many guys who could get them immediately hooked. Subban is an exception. And once that person started paying attention to Subban, they’d get to see one heck of a hockey player. On the power play in the first, Subban reared back and fired his signature heavy slapshot from the edge of the circle. The puck was tipped in front by Colin Wilson for the game’s first score. No one got a stick on Subban’s shot on this play in the second, and more importantly, Jake Allen couldn’t get his glove on it. Later that period, it was yet another slapper from Subban on the power play (more like PP Subban, am I right?? ), and yet again Allen couldn’t corral it. Filip Forsberg tapped home the easy rebound. Yesterday was the seventh anniversary of Subban being thrust into his first career playoff action with the Canadiens thanks to injury, after appearing in just two regular season games. He would respond with eight points in 14 games, and give himself a reputation as a big-game player that he’s only continued to live up to. 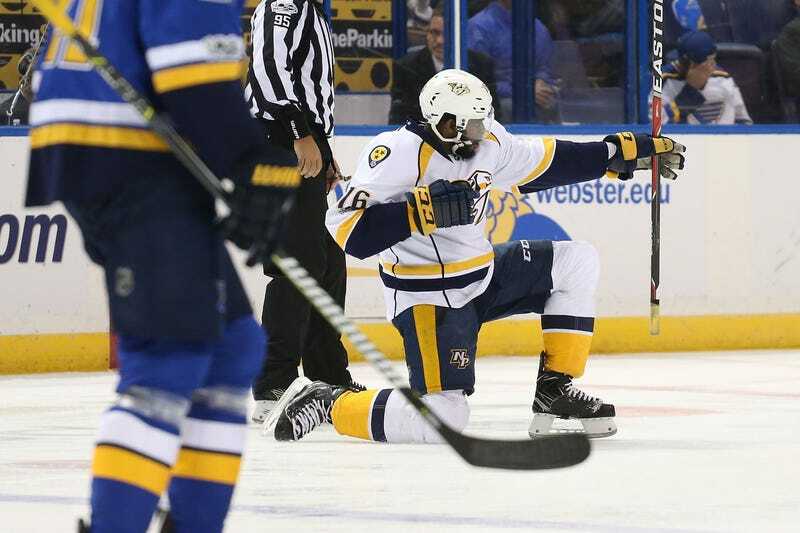 Game 1 was tight than these Subban highlights make it look—the Blues stormed back to tie things in the third before Vernon Fiddler poked free a puck for the game-winner with 5:05 left. This ought to be a good series: The Blues were the NHL’s best team after Feb. 1, when the team changed coaches and defensive systems, and Jake Allen’s been one of the league’s best goaltenders since then—his unbeatable play in St. Louis’s series win over Minnesota was just a culmination of that. But the Predators—especially these playoff Predators, who convincingly swept the Blackhawks in the first round—are as good as anyone on any night. The loss of rookie forward Kevin Fiala will sting, but they’re talented enough and deep enough at both ends of the ice to keep rolling without him. Subban’s the headliner—as he ought to be—but the bigger developing story is that the Preds still haven’t lost in the postseason. We’re all still learning what they’ve got going in Nashville, but why should we be expected to when even their opponents haven’t yet figured it out?